When Artists Take on the Legacy of an Historic Artist, More Art Ensues! In 1932, the noted American painter, Agnes Lawrence Pelton, settled in the Cathedral City Cove. For three decades, her home and gardens became a neighborhood cultural center, where she attracted other plein air desert painters and convened an ongoing artists colony, whose history was almost forgotten after she passed away in 1961. To showcase their art, on occasion, Pelton hosted garden parties, where her home became a veritable pop-Up gallery, which eventually became and continues today as the Desert Art Center in Palm Springs. Seventy years later, Pelton’s legacy is now championed by two fine artists Peter Palladino and Simeon Den, who purchased the property in 2009 and started the Agnes Pelton Society, a non-profit arts advocacy, whose mission is to support local artists, provide arts education for children, and to preserve and archive all things Agnes Pelton. Their ongoing restoration and reimagining of the house and gardens is evidence that when artists take-on the legacy of a great artist, more art-making ensues! To pay tribute to Pelton’s legacy and commemorate her historic garden parties, the Agnes Pelton Society is opening the gardens to the public for the first time in modern history. 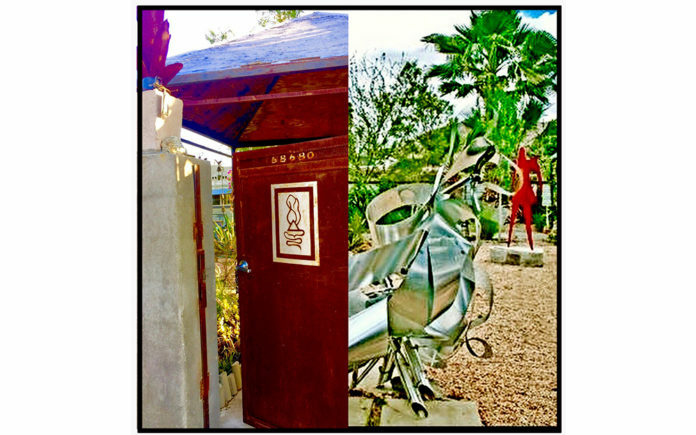 Visitors are invited to stroll through the newly designed Zen Meditation grounds, view newly commissioned murals and mosaics, and walk through the Sculpture Gardens, which is the setting for sculptures by stalwart desert artists– Tony and Karen Barone, Mario Pikus, Robert Reeves, Jeff Spakes, and Michael Thiery. Additionally, visitors can browse the Chuperosa Lane Murals Path that borders the property, where local artists were commissioned to paint several colorful murals– one depicting the aforementioned founding art colonists, another of Lalo Gurerero, who was a former Cove resident and known as the Father of Chicano Music, another with desert motifs with whimsical flying saucers, and the recently created mosaics portraying Frida Kahlo and a fictional Lady of Chuperosa. The event will offer live performances that include Butoh Dances, acoustic classical music, songs by Mexican Floklorico singers, hula, poetry readings, and sake tastings by Wabi Sabi Palm Springs. A highlight will be the unveiling of a twelve foot high mosaic by Peter Palladino, that honors the APS Advisory Board member, Karen Barone. The historic Pelton House itself will not be open. Only once-a-year, the house is open as a museum and next year the Annual Pelton House Art Block Party will be celebrated during Modernism Week on February 17th. The Agnes Pelton House is located at 68680 F Street, Agnes Pelton Way, in Cathedral City and the event is scheduled for Saturday, September 22, from 5-7pm. Information and tickets are available at www.agnespeltonsociety.com and at the door for $10, cash and checks only. Children are admitted free and the event is dog friendly.